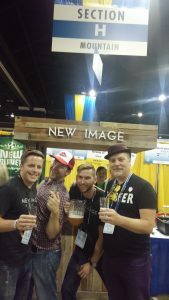 I had a fabulous time at the Great American Beer Festival this year! It was my first as a member of the media and I had a tough time separating the advice of visiting breweries that I haven’t been to before and visiting the 152 Colorado breweries as the Colorado Beer Geek (since I’ve been to all of them already). I think I struck a nice balance and focused my Colorado visits on some of the newest and a couple that haven’t opened their own taproom yet. Having just opened in April, the newest Colorado brewery at GABF this year was Seedstock Brewery. I was there at their opening but I really need to make it back there soon! I was quite impressed by their Dusseldorf Alt, Premium Czech Lager, and Bohemian Dunkel. All styles that I very much enjoy and I was very happy with them. The second newest Colorado brewery that was there was New Image Brewing. I was thrilled to see them there as they are currently my favorite brewery of the Class of 2016. As such, I timed my (post event) Untappd 5,000th unique beer check in to be their G-Line which is dry-hopped Belgian pale ale. Another new brewery that I want to give mention is Holidaily Brewing. They opened in February this year in Golden as a completely Gluten-Free brewery. For those skeptics out there on GF beer, give these guys a try! They make some really great beer that you really can’t tell is GF. That is because instead of the sorghum that other GF breweries use they use millet and buckwheat to make some wonderful beers. Opening last November, El Rancho Brewing walked away with a Gold medal in the Historical Beer category with Valhalla, a Sahti style beer made with Finnish malt, Norwegian yeast, and juniper berries. I am really upset at myself for missing this as I love this category being a history geek who is particularly attracted to Viking history. I’ll need to head up into the hills soon and hope they have it on tap! Also opening last November, Cerebral Brewing won a Silver medal in the Brett Beer category with Dreamy Thing, a collaboration with their friends at Our Mutual Friend Brewing. It is a Farmhouse Pale Ale brewed with Citra, Centennial, and Sterling hops then fermented with a blend of 12 Brettanomyces strains in stainless for 3 months. I also didn’t get a chance to try this so I’ll plan to drop by Cerebral soon. In addition to these new breweries, there were two Colorado breweries that are currently in production only but have definite plans to build out a tap room. 14er Brewing certainly impressed the GABF judges by taking the Gold medal in the Chili Beer category with their Rocky Mountain (Jalapeño) Saison. At my first visit to their booth (before the awards) I avoided trying it as chili beers tend to wreck the palate. However, after taking Gold over 111 other entries I had to give it a shot. Wow! What a great beer! Nicely spiced with jalapeño without being overly hot. Even without this win, I was excited to meet the guys behind 14er as they are busily working on securing a location for a tap room. While they asked me to keep the exact location under my hat I will say it is an exciting place to be if/when they get it. Hopefully I will hear good news soon and will share it with you. The other currently production only brewery there that I was happy to see was Good River Beer. I absolutely love their Gunny Black Lager, an amazing Schwartzbier. You can find Good River Beer at tap rooms all over Denver such as Tap XIV. I was really happy to briefly meet the team and look forward to hearing news about their new tap room very soon. I visited a number of other good Colorado breweries and really enjoyed trying some new beers that I haven’t tried before. It only makes me want to visit again. Shout outs to Castle Rock Beer, CO-Brew, Factotum Brewhouse, Fiction Beer, Periodic Brewing, Elevation Beer, Weldwerks Brewing, & Wit’s End Brewing (where my journey began). I’m sorry that I wasn’t able to visit more. As a side note, as far as out of state breweries go my favorites were Funky Buddha Brewery from Florida & Taxman Brewing Company from Indiana. Every single one of their beers were amazingly yummy!!! Overall, Colorado breweries did an outstanding job in representing our great state. It is good to be The Colorado Beer Geek!